“Where the world’s most influential creative thinkers share their insights”. That’s how the Cannes Lions event describes itself. But what is it, more detailed? What is its history, and what is the purpose of the Cannes event? 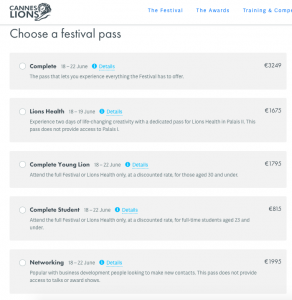 In this article, you’ll learn everything you need to know about the Cannes Lions event. Let’s start with the most important – understanding what Cannes Lions is. The best way to learn about something is to ask people who have experienced it, and in this video, we get to hear the options and explanation from several people who have attended the Cannes Lions events. Cannes Lions calls itself “The world’s most inspiring creative festival” and that’s exactly what it is. Cannes Lions International Festival of Creativity is an event in Cannes formerly named International Advertising Festival. But due to its long name, it is most usually just referred to as Cannes Lions. Cannes Lions is a global event focused on the people who work in the creative communications, advertising, and related fields. The event attracts thousands of attendees every year, thousands of brands, as well hundreds of top corporates such as Google and YouTube. Cannes Lions is considered to be the largest gathering of the advertising and creative communications industry in the world. In fact, each June, when Cannes Lions is held, roughly11,000 registered delegates from 90 countries attend the festival to celebrate, as well as improve and get inspiration for creativity and brand communication. The event runs for seven full days, packed of talks, presentations, workshops, networking events, classes, mingles, as well as award shows dedicated to people in the branded communications, marketing, design, tech, media, and entertainment industries. During those seven days, the world-famous Lions awards are held in Palais des Festivals et des Congrès in Cannes, France – the palace of festivals and congresses. The main reason brands and people working in the marketing, and communication fields are coming to Cannes Lions is to explore the power of creativity as a force for business, and to learn more about how they can leverage it for marketing success. 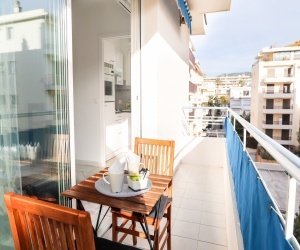 The Cannes Lions event is, unsurprisingly, inspired by the world-famous Cannes Film Festival – a festival that has been arranged since aged the late 1940s. A group of cinema screen advertising contractors that belonged to the Screen Advertising World Association (Sawa) felt that the people who were creating the advertising films didn’t get enough recognition, for their creativity and creative, as the actors and actresses, thus the International Advertising Festival is born. But unlike what you might think, the first Cannes Lions event did not take place in Cannes on the french riviera. Instead, the first International Advertising Film Festival took place in Venice, Italy, in September 1954. The festival’s first edition attracted 187 film entries from 14 countries. Regarding the logo, which appropriately is a lion, the lion of the “Piazza San Marco” in Venice worked as the inspiration for the Cannes lions trophy that is handed out to the winner of the event during the price award for best creative. The price comes in bronze, silver, gold, and is handed out to companies in a number of different categories, as seen above. Moreover, you can see the winners of the different categories in 2015. The second edition of the Cannes Lions festival was not held in Cannes either. Instead, the festival was held in Monaco, Monte Carlo. But for the third edition of the Cannes Lions festival, Cannes was the town that hosted it. You might think that from that, it has been held in Cannes ever since, but that is actually not the case. Instead, after the third edition, when being held in Cannes, it alternated between Venice and Cannes several years, before finally settling in the latter in 1984. From 1984 to date, the event has therefore been held annually in Cannes. While the mission of the event: to acknowledge creativity and the people behind the advertising remains the same after all these years, there have been a few changes to the events. However, in recent years there have been calls from within the industry for the Festival to simplify the entry categories to better reflect the current state of the modern communications world. Cannes Lions also added a new form for learning, which came in the form of learning in the form of seminars and workshops, hoping to bring more value and knowledge to the attendees, in the 1990s. 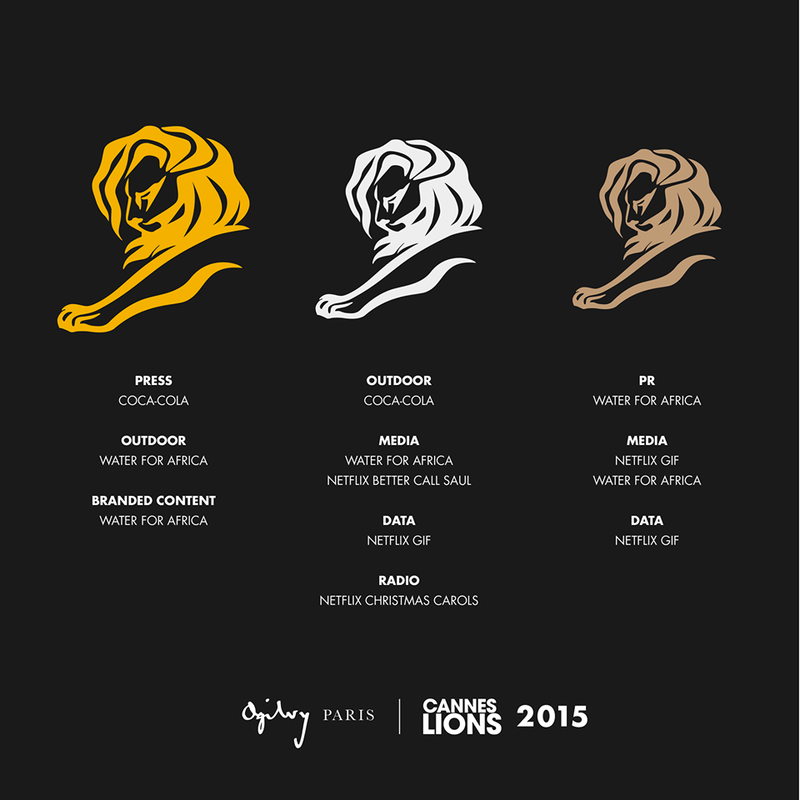 Cannes Lions has grown tremendously over the years. Both in terms of what it offers marketers and business people, but also in terms of brands and people who attend the festival. As you can expect from the age of the event, it has been owned by a number of different people. In fact, in 2004, a British publisher and conference organizer called Ascential purchased the festival from the then current owner which was the French businessman Roger Hatchuel. Roger Hatchuel himself had managed and arranged the event since 1987 when he had then bought it for a reported £52 million. Today, a man named Jose Papa is the managing director. Philip Thomas is the chief executive officer of Ascential Events, which in turn owns Cannes Lions. Moreover, Terry Savage is the current chairman of the festival. Every year, together with the event, is an award held, where people and brands who have made great things within the advertising, creativity, and communications industry are awarded within different categories, and with different prices. 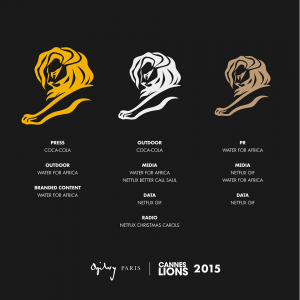 As you could see in the list of the different categories that had been added, Cannes Lions added a new category in 2013, named the Innovation Lions. When it comes to awards, there are a number of awards you as a brand can get, if you’ve done something extraordinary within the are that the Cannes Lions event is focusing on. Some categories for awards are. And lastly, Palme d’Or award to the best production company. In order to compete, you have to enter. Normally, the brands who create the advertisements are also the brands that enter, alternatively the agencies that have been hired to create the advertising. In 2013, a world’s first in the event took place. Back then, the advertising campaign “Dumb Ways to Die”, created by McCann Australia for the Australian Metro Trains won a total of five Grands Prix awards. This is the most awards a single piece of work has ever been awarded in Cannes Lions. This category started in 1995 and can be one by advertising professionals who are up to 28 years old, working in teams of two. Cannes lions attract some of the leading individuals in the industry, and over the years, it has hosted tons of influential people, who have also held presentations and keynotes that attendees can listen to. 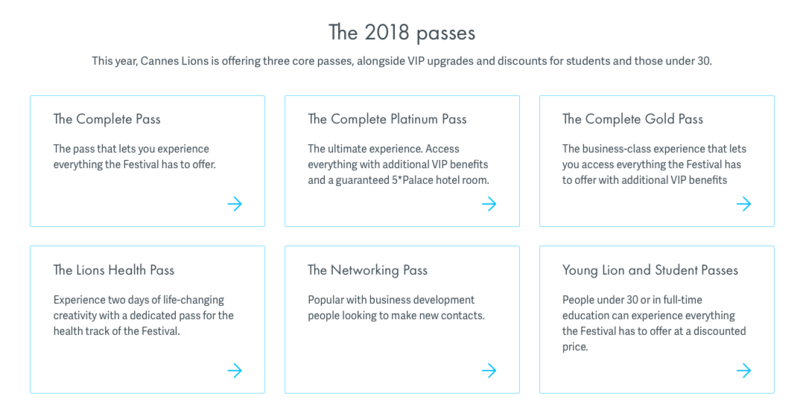 There are different packages you can choose from for Cannes Lions 2018. The price, the days, and the things you get access to varies between the different packages. 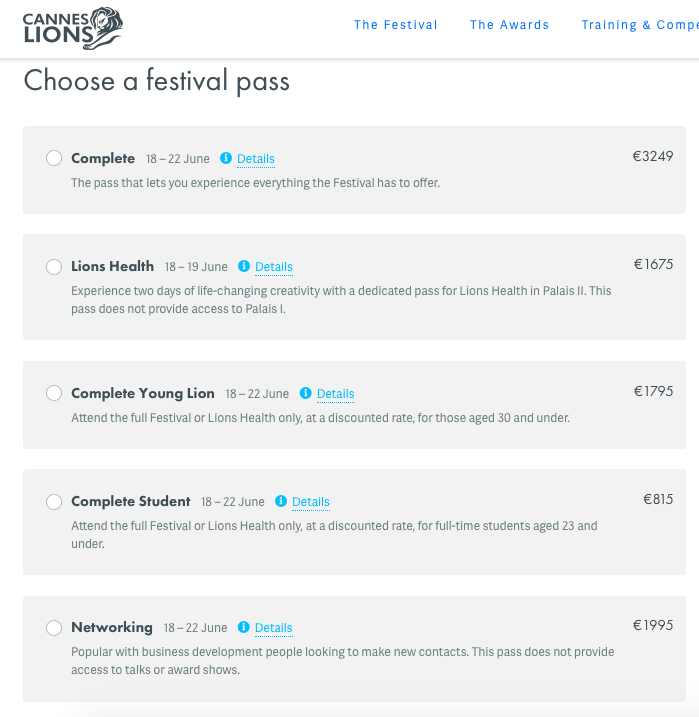 To purchase, you can visit Cannes Lions here. Cannes Lions attract thousands of like-minded people who are all interested in the same thing as you if you’re a marketer. On top of that, it attracts some of the worlds most authoritative and influential people in the space, such as entrepreneur Gary Vaynerchuk, and Mark Zuckerberg. This makes Cannes lions an exceptional even for networking and building contacts with tons of people. The best part is that Cannes Lions represents the industry at all levels, creating the opportunity for you to make valuable new contacts. No matter where you are on the event, whether it be the beach, at the bar, or at an event, there will be valuable people you can talk to and share experiences, plus, of course, learn a lot while doing so.